Kepler's Third Law and The "Harmonices Mundi"
John Kepler (1571-1630) is one of the most interesting figures in the history of modern thought. The German astronomer managed to combine the demands of the new science of nature with his religious faith, in an effective synthesis that characterized all his research and, more generally, the entire course of the Scientific Revolution. This year (2018) marks the 400th anniversary of one of his fundamental discoveries, the third law of planetary motion. Kepler’s third law states the proportion between the square of planets’ revolution time and the cube of their average distance from the Sun (T2 = K R3). 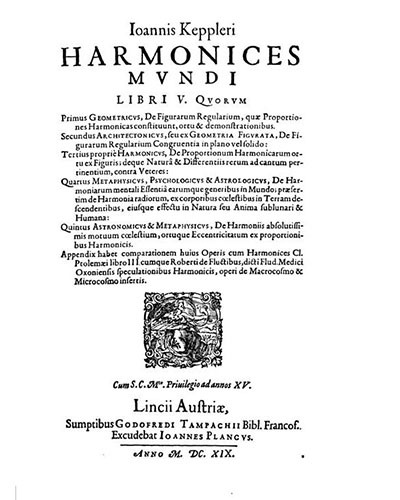 In May 1618, Kepler had already fine-tuned all the details of his theory, although the printing of the Harmonices Mundi, the work containing the third law, was completed in Linz only during the summer of the following year. The publication of his book happened during a particularly troubled period in Kepler's life, a period marked by several negative vicissitudes, such as his mother's witchcraft trial and various family losses. The attention he devoted to the elaboration of this theory and the achievement of such a relevant result helped him in that difficult phase of his existence. In the months preceding the discovery of the third law, he managed to forget about the negative events and focused on his work. The dedication to such an important project, and the considerable results already achieved in the past, were the right incentives to continue his investigations. The Keplerian idea of a mathematical-musical harmony of the heavens can be found in the works of other modern authors. Kepler, however, was also inspired by the harmonic structure of the planetary movements acquired by reading ancient works. Among these, besides the Platonic dialogues and texts of the Pythagorean philosophers, we point out the importance of Claudius Ptolemy’s Harmonics (ca. 100 A.D. – ca. 175 A.D.), whose manuscript was provided to him by his friend and correspondent Herwart von Hohenburg and whose contents were particularly appreciated by Kepler. Another author who had a significant influence was the neo-platonic Proclus (412-485) who, in the commentary to the first book of Euclid's Elements, spoke of geometric figures as the foundation of the matter’s real structure. In the autumn of 1617, a few months before the discovery of the third law, Kepler also read the Dialogo della Musica Antica e Moderna by Vincenzo Galilei (1520-1591), musical theorist and father of the most famous Galileo, who studied the concepts of consonance and dissonance. However, the Keplerian scientific project brings together other essential elements, such as the crisis of the Aristotelian-Ptolemaic cosmological model and the advent of modern mathematical realism. According to Kepler, in our soul there are the mathematical paradigms that enable us to grasp through the senses the proportions evident in the world around us. The soul essentially is harmony, and there are three disciplines based on harmony itself: geometry, music and astronomy. The human mind, made in the image of the divine mind, has within itself the forms and laws of geometry which, in turn, are based on the same numerical relationships that determine the other two disciplines. Therefore, there is a direct correspondence between the numerical ratios of musical harmonies and those of geometric laws. This is the reason why the movements of the planets, structured by the supreme intelligence of God, must be interpreted in the light of the harmonic beauty at the base of creation and given by God to the human being. The book of nature, part of the Revelation, manifests itself to humanity in all its extraordinary precision, as the study of astronomy unveils. The search for mathematical elegance in planetary trajectories characterizes the activity of the astronomer – which Kepler defines as the “priest of nature” – since he studies the regularity wanted by God himself. Performing astronomical calculations, therefore, means interpreting the Creator's own thoughts, and explaining the celestial harmonies of the planets means expressing gratitude to the Author of natural harmony. One can see, in all of this, the influence of the principle of analogy which has been decisive for the achievement of modern scientific thought. Kepler’s Christian faith cannot be seen as a simple psychological element; it constitutes a spiritual dimension that indicates the only viable way for science, as it at the same time advances problems and indicates their solutions. The method adopted by Kepler is mainly deductive, as he starts from the conviction about the geometric structure of the universe to interpret the data of astronomical observation. This is how our scientist has managed to interpret the large amount of data collected by Tycho Brahe (1546-1601) and his school, and to formulate his three laws. The principle of universal harmony leads him to reject the idea of the infinite dimensions of the universe (even though in Kepler’s theory, the dimensions of the world are larger than in Copernicus’ theory). Infinity is not measurable and actual infinity would be in contradiction with the creation of cosmic harmony as an essential factor of revelation. With the publication of the Harmonices Mundi (1619), Kepler completed the research programme he had planned since the Mysterium Cosmographicum, published in 1596. 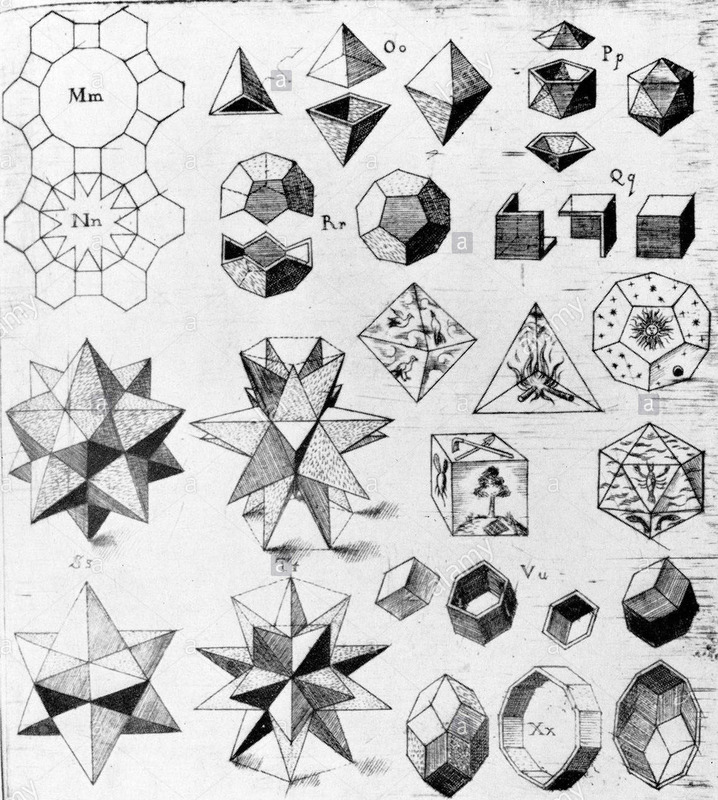 In the early stages of his studies, he was mainly interested in understanding the meaning of the divine design at the time of creation; the initial attempt to insert the five regular solids (cube, tetrahedron, dodecahedron, icosahedron, octahedron) to determine the distances of the planets from the sun, however, did not convince him. In the end, the mathematical relationship between the square of the times of revolution and the cube of the average distance of the planets from the Sun represented the crowning of his enormous intellectual effort. This discovery, moreover, had a decisive influence on the work of Isaac Newton (1642-1727), who started from Kepler's work to find the law of universal gravitation. In the Keplerian vision, in fact, planetary movements are the result of a real energy emanating from the Sun. Moreover, the fact of placing the sun in one of the fires of elliptical trajectories implies the coincidence between mathematical description and physical reality, helps rejecting the idea that astronomical science is only to "save phenomena". Although the explanation of planetary motion in terms of quasi-magnetic forces was later abandoned, this third law has reinforced within the modern astronomer community the idea of planetary motion as the effect of a combination of geometric models and celestial forces. In this way it is understood in what sense Kepler believed in the existence of a universe according to the original meaning of the term (unum in diversis). In his conception, the planets move in a global cosmic harmony, based on divine mathematical archetypes. In other words, the musical harmony of the heavens is not a trivial metaphor and this structure of the world depends on the fact that it reflects that of the Divine Trinity, with the Sun representing the Father, the Earth symbolizing the Son and space symbolizing the Holy Spirit. It is precisely the similarity between the Divine Persons and the structure of the cosmos that confers to the latter the rational and organismal character, in a final synthesis in which the scientific and theological dimensions are inseparable. The third law, like the first two announced in the Astronomia Nova, is the result of that basic vision that has animated all his research. The universe, according to Kepler, was ordered by God according to precise mathematical relationships that the human being, made in the image and likeness of the Creator, must discover. Human research will never allow man to share the totality of the divine essence, but only the mathematical principles that govern nature. Astral movements, therefore, are not only an effect of the energy emanating from the Sun, but are the result of a designed universal harmony able to balance the same energy and other numerical characteristics of the planets, such as their distances and dimensions. The reading of some particularly significant passages of this work highlights Kepler's willingness to pursue his scientific goal, i.e. confirming the existence of precise mathematical relationships in the celestial motions. In the Proemio he reiterates that geometric figures constitute the archetypes of the divine mind and, therefore, precede their concretization in creation and their presence in the human mind. Ultimately, the Harmonices Mundi is the result of a great cosmic vision in which science, philosophy, art and theology converge. It is a unique conceptual synthesis, realized by a brilliant mind and always aiming at the discovery of natural laws inserted in the plan of creation. Kepler's work must also be considered as yet another demonstration of the fact that exact science was born within the Christian tradition and thanks to authors who saw the universe as a creature structured by God, according to precise numerical relationships. In the past, too hasty historical reconstructions or those influenced by prejudicial conceptions have superficially affirmed the existence of a rational logic of scientific discourse in opposition to the uncertainty of the presuppositions of the faith. Overall, Kepler's work is one of the most significant denials of this position, which is absolutely unjustifiable from a historical point of view. Johannes Kepler, New Astronomy, engl. tr. William H. Donahue (Cambridge: Cambridge University Press, 1992), pp. 59-64. J. Kepler, The Harmony of the World, edited and translated by E.J. Aiton, A.M. Duncan, J.V. Field (Philadelphia: American Philosophical Society, 1997), p. 146.